So easy to make and great for the summer. Pour the sugar and berries into a saucepan with the lemon juice and half the apple juice and slowly bring to a simmer. Remove from the heat and using a hand blender blitz the frozen fruit, then add half the yoghurt. 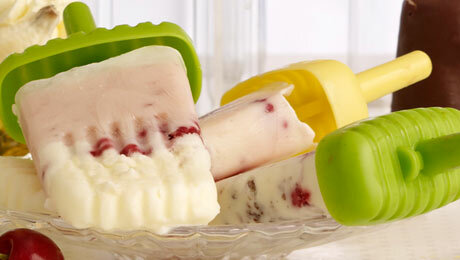 Place the remaining vanilla yoghurt into the top of the ice lolly moulds, then top each mould with the fruit and yoghurt mixture. Place in the freezer and allow to set for 2–3 hours. Once removed from the freezer serve immediately.